When you gather friends together, a party can ensue. But what is a party without good music? A boring party - of course. Back in the day, the boombox served as the powerful speaker to get the music to the crowds. But, the boombox went the way of the cassette tape. Since today you can't have everyone huddled around a pair of ear buds or a single iphone, portable Bluetooth Speakers are a must. A perfect, portable, smaller option is the Insignia Bluetooth Speaker. 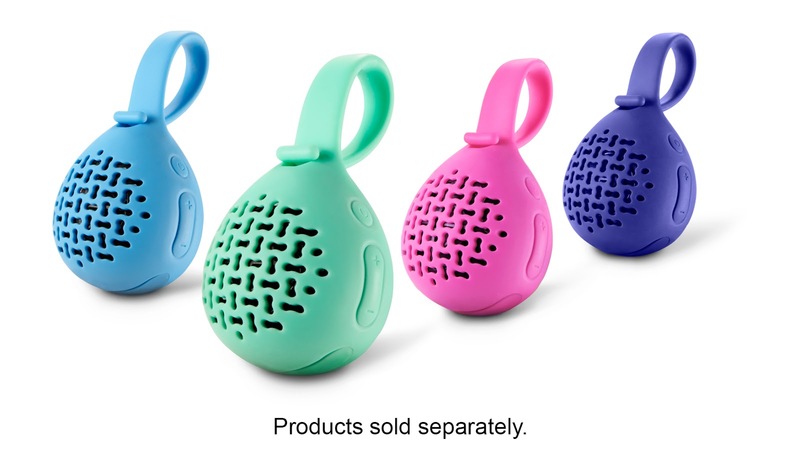 The Insignia Bluetooth Speaker is a compact, portable speaker that is bright, colorful and fun. Before a note is played, the adorable design and bold colors add life to the party. Whether attached to a back pack or resting on a table, these speakers can blast the music as loud as you need. No need to worry about weather or a split drink, this Insignia Bluetooth Speaker is splash proof. With a rechargeable battery, the wireless streaming can go up to 6 hours on a full charge. Plus, the speaker's USB charging port keeps electronic devices powered. The Insignia Bluetooth Speaker is available at Best Buy for $19.99. 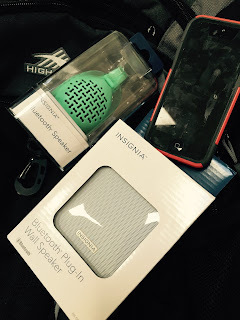 For an at home party, the Insignia Plug In Bluetooth Speaker is a great solution. When it comes to home entertaining, simple and easy are key phrases to success. The Insignia Plug In Bluetooth Speaker exemplifies these adjectives. This speaker allows the home user to wirelessly stream audio to any room in the house. The speaker plugs directly into a wall unit. No wires, shelf space or expensive receiver are required. Plus, the sleek white design helps the speaker to blend into any area. The Insignia Plug In Bluetooth Speaker is compatible with most Bluetooth-enabled devices or can be used with an auxiliary audio input jack for non-Bluetooth devices. The speaker's USB charging port keeps electronic devices powered so the music keeps going throughout the party. Plus, the speaker can be used away from the wall plug-in because it has a built-in rechargeable battery with two hours of playback. The Insignia Plug In Bluetooth Speaker can be purchased at Best Buy for $29.99. Don't let the party be boring because the music is pushed to background noise. Make music the star of your gathering, event or your daily outings with an Insignia speaker. Music makes life more energetic. What a fun bluetooth speaker set. I love the colors and know my teens would too. 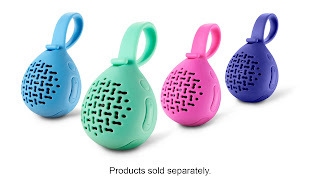 I really like this Bluetooth speaker because it can be attached to something secure (so your child wont lose it). The colors are really cute! Our speaker broke on our latest camping trip. these look like a great option. Oh these speakers are so awesome. Being that they are so small is easy to take them anywhere. Love it thanks for sharing! These are so cool and I love how portable they are! Great for long car rides, outdoor activities, etc. They're very reasonably priced as well! We are always looking for good speakers! I love that this one can hang-perfect for the beach so that it doesn't get in the sand! I love to keep one of those speakers around as a go-to gift. I've given them to lots of people and they're always a huge hit.